DeGroot, Henri L.F., Peter Nijkamp and Roger R. Stough, (eds). 2004. Entrepreneurship and Regional Economic Development: A Spatial Perspective, Edward Elgar Publishing, (ISBN 9781843768906). Dietzenbacher, Erik and Michael L. Lahr (eds). March 2004. Wassily Leontief and Input-Output Economics, Cambridge University Press, pp. 418 (ISBN: 0521832381. Okuyama, Yasuhide and Stephanie E. Chang (eds). 2004. 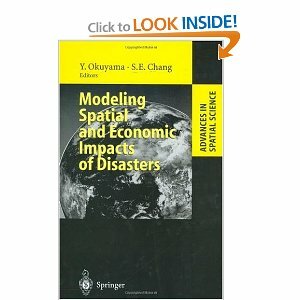 Modeling Spatial and Economic Impacts of Disasters, Springer-Verlag, 300 pp. (ISBN: 03-540-21449-6). Anselin, L., R. Florax, and S. Rey (eds). 2004. 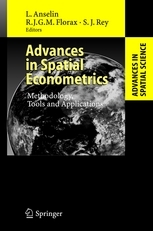 Advances in Spatial Econometrics, Springer (ISBN 3-540-43729-0). Florax, R., and D. Plane (eds). 2004. Fifty Years of Regional Science, Springer (ISBN 3-540-22361-4). Anselin, L., M.M. Fischer, G.J.D. Hewings, P. Nijkamp, and F. Snickars (eds). 2004. Advances in Spatial Science, Springer (ISBN 1320-9602).